We can finally confirm that BlastFlow Siberian modular water cooler from Vadim - Vadim computers is out. 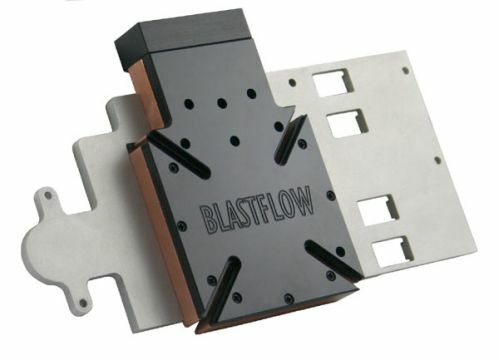 The whole point is that you can change the cooling plate and use the same water block over and over again. The new cooler weighs about 500 grams, it will come in black acrylic and it is future proof. It fits Geforce 8800GTX and Ultra cards, and, with a new cooling plate, it should also fit the new Nvidia cards. The internal part is made of copper and is sandblasted for better heat exchange. The bottom of the copper base is polished and the aluminum cooling plate is sand blasted, too. The cooling plate has been a bit redesigned; the contacts with the copper part are doubled, so the memory and VRAM regulators get more cooling. The cooler is out in the U.K. and you can order it for £89 excluding VAT and £105 including VAT, while in the U.S. will see this product for US$189 on November 1st. The retail package comes with arctic silver 5, retail packaged with full pictured instructions how to install it. The key point of this cooler is that the block can be used for a new card, you just need to buy a new plate. The company plans to introduce the 8800GTS and R600 plate and will sell it for US$45 or £21. There will be a fitting for Geforce 8800GT and it is possible to make the dual PCB version of a cooler if Nvidia decides to take the GX2 road.